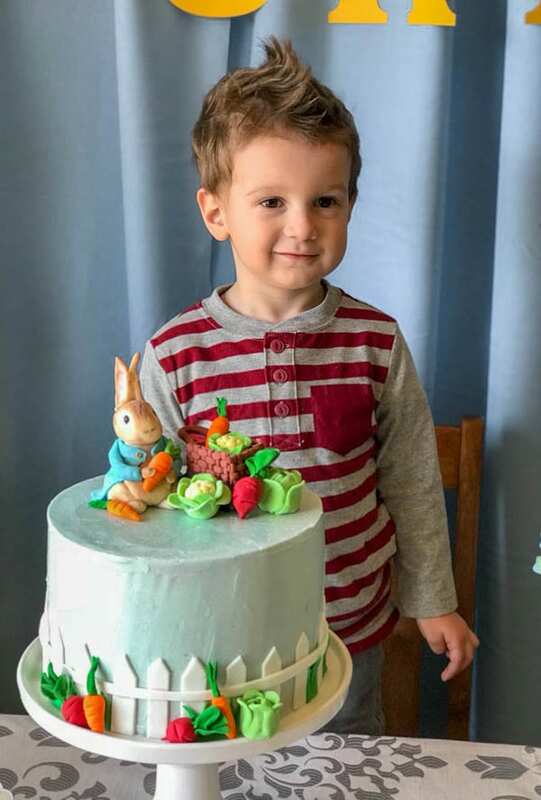 My son Luke got a Peter Rabbit Birthday Party this year!! 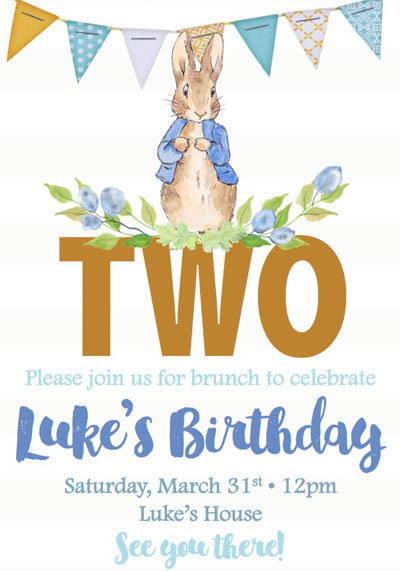 Luke turned 2 years old, just a day before Easter! 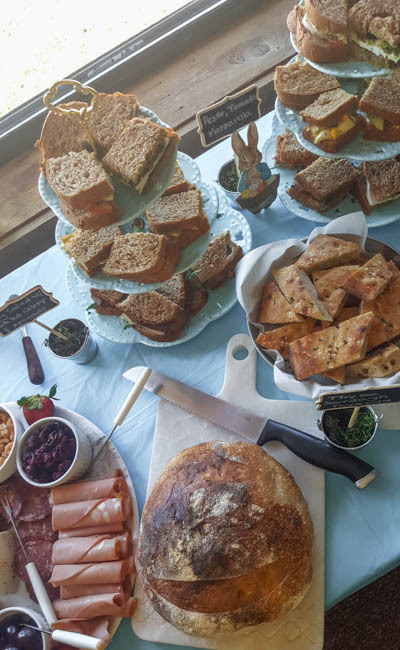 So the theme seemed fitting and I decided to throw a small brunch for our closest family and friends! It was a very very small party, since it was hosted at our very small apartment! But I made the best out of it, and tried to focus on the little details that would make this a great party! 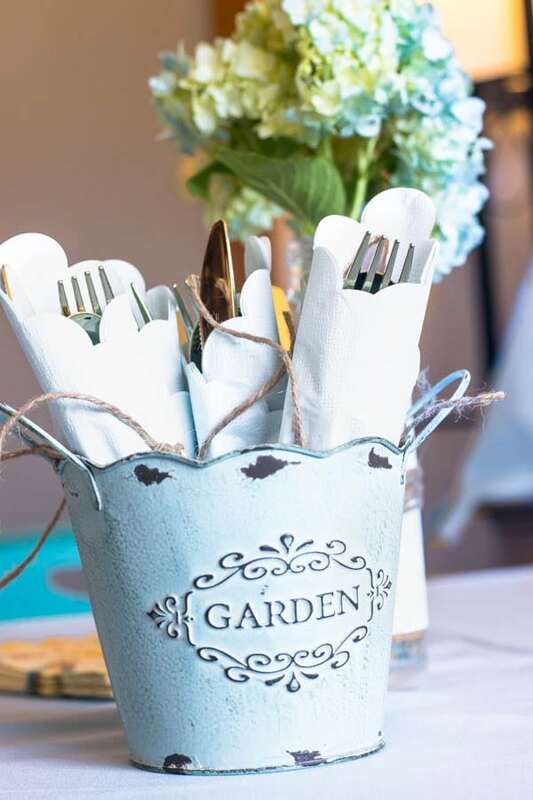 Whenever I throw a party or a dinner, I always try to focus on the small things, such as silverware presentation (don’t laugh!). Just to make the party cuter and more fun (at least for me, because I love doing this kind of thing). I feel really bad I couldn’t get a picture of everything. As soon as guests start to arrive, I devote my attention to them, and to the birthday boy, of course. And to putting food out! So, I guess you can say I had a lot on my plate and unfortunately, wasn’t able to get as many pictures as I would have liked. Let’s break this party down! Since it wasn’t a lot of people, I couldn’t do a huge feast, but I still made more food than I probably should have. 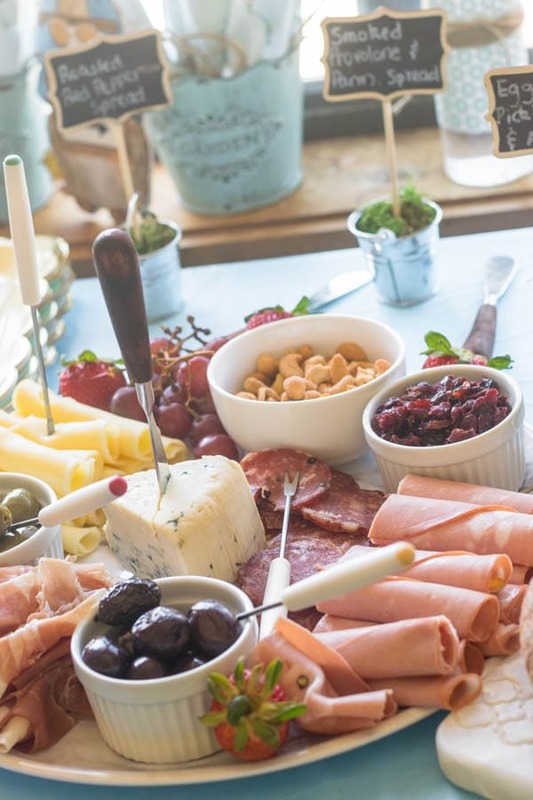 We started with a charcuterie platter: Pistachio Mortadella, Prosciutto, Swiss cheese, Gorgonzola, Sopressata salami, cashew nuts, cranberries, grapes, strawberries, Alfonso olives, green olives. And two kinds of spreads, Roasted Red Pepper, and Smoked Provolone and Parmigiano. The Smoked Provolone and Parmigiano spread was actually made by my dad. And it was a big big hit!! So, a huge shoutout to my dad for all the help he has given me! And all the dishes he has washed, because I tend to make a LOT of dishes (sorry, dad!). 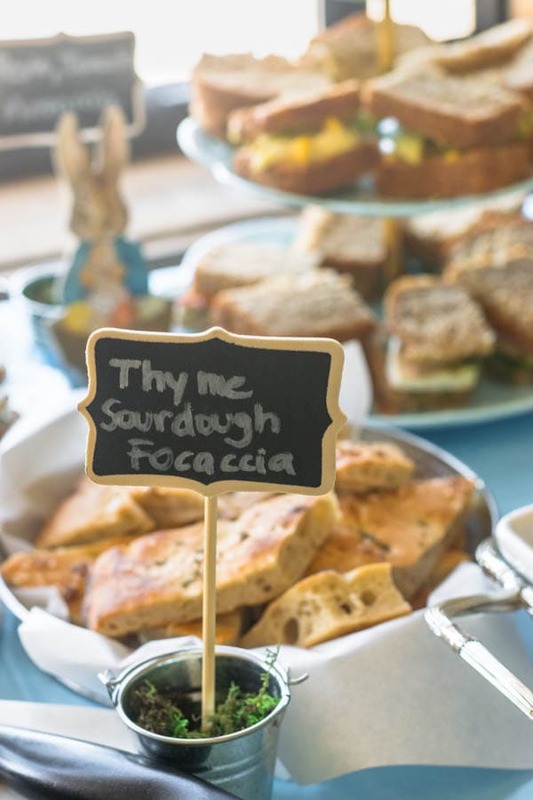 We also had Thyme Sourdough Focaccia, and some crusty Sourdough Boule (not pictured) to go with the charcuterie board. Mozzarella, Pistachio and Arugula Pesto, and tomatoes. Lion’s Mane mushrooms, ham and provolone cheese. And to round up the savories, I made pão de queijo, which are traditional Brazilian cheesy rolls made with sour cassava flour (tapioca flour makes for a great substitute, btw). Now that’s a real bummer I couldn’t get a nice picture of my drinks!!!! I am so upset! I had Strawberry and Lemon flavored water, freshly squeezed Limeade, two beautiful pitchers of homemade Iced Coffee and Iced Tea! I even had a cute little container with some simple syrup to sweeten the drinks! Oh! And of course, Mimosas with freshly squeezed orange juice (thanks, dad, once again! 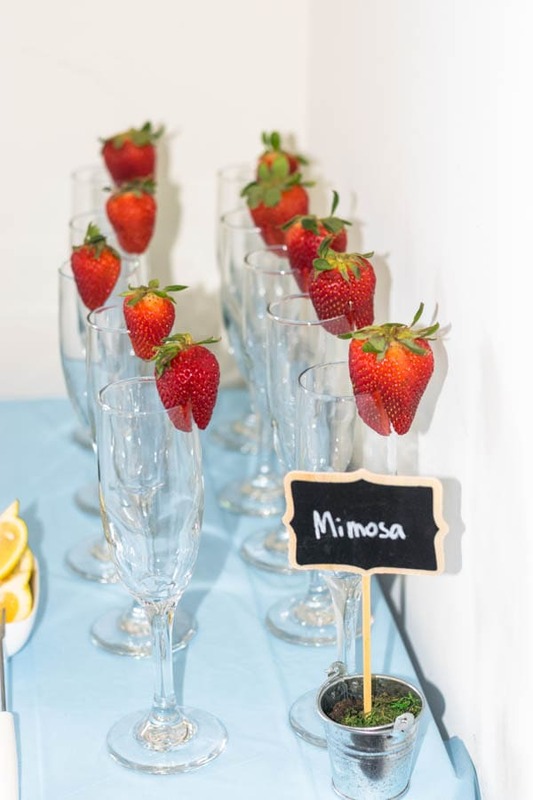 ), since the theme was Brunch! This was the dessert table, before I can start specifying what is what here. 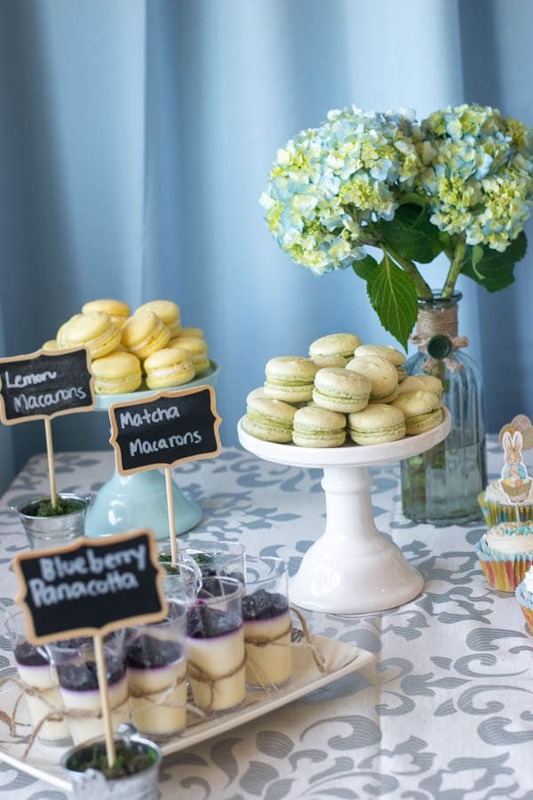 First, let’s talk about the macarons. I wanted to keep the colors within the theme (blue, green and yellow). We also had Blueberry Panacotta, as you can see above! We had some cute little Bunny Tails, which were Brazilian Beijinhos (condensed milk coconut fudge balls YUM). 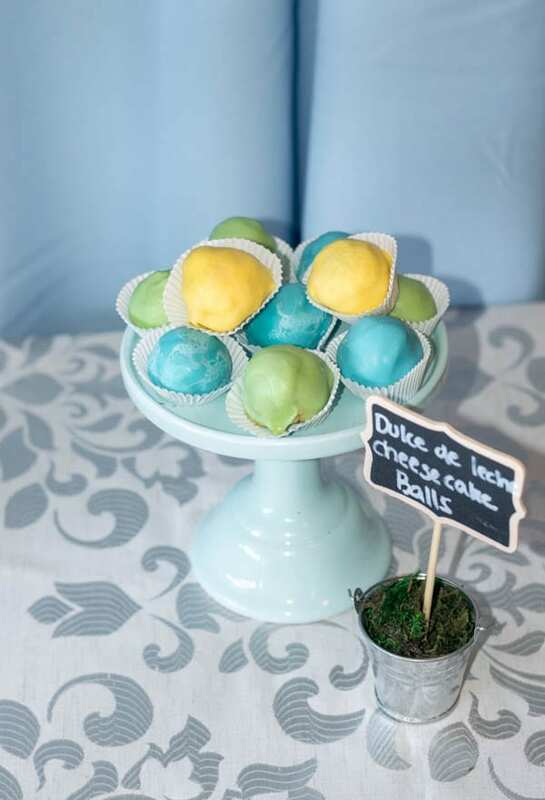 Still within the color palette, we had these delicious Dulce de Leche Cheesecake balls. 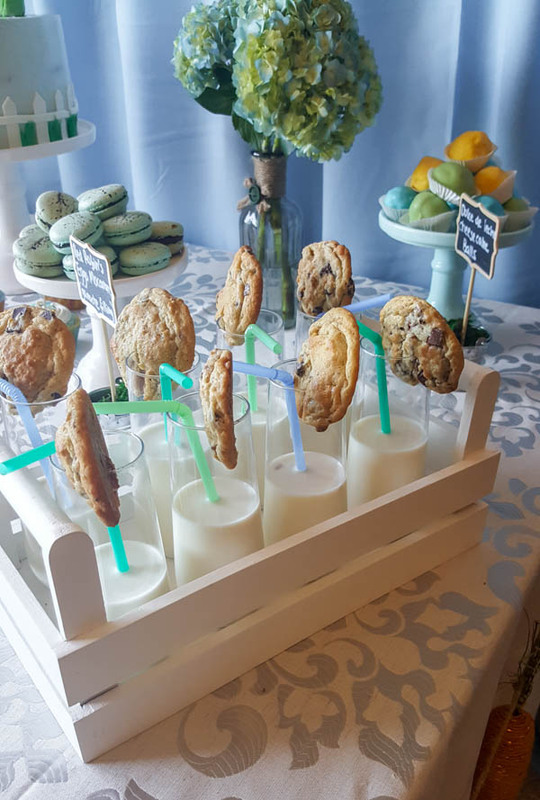 And to make it fun for the kids, I made these cute little cups with Milk and Chocolate chip Chunk Cookies. If you want to hear about the cake, here’s the deal. I started to make the cake about 2 weeks before the party happened. And that’s because of the fondant toppers! 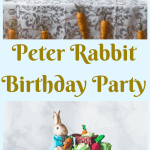 It took me 4 attempts to get to a Peter Rabbit that I was pleased with. 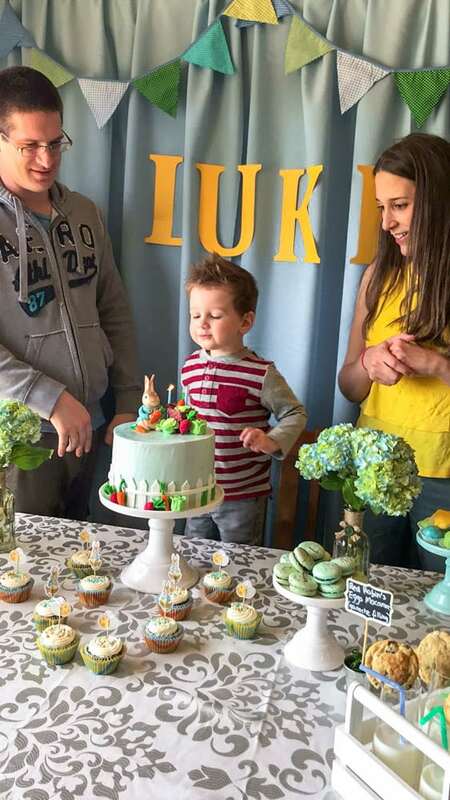 And of course, the morning of the party, Luke broke the ears of Peter Rabbit #4. 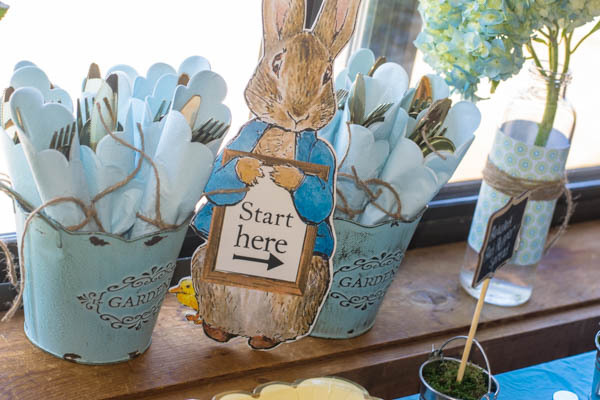 So I had to use Peter Rabbit #3. I think it was ok, though, don’t you think? The cake was vanilla. There were 5 layers of fillings. The top and bottom two layers were raspberry jam and the middle layer was a delicious and superb Macadamia Buttercream! On the outside, Swiss Meringue Buttercream, cause that’s my ultimate favorite! And I wish I had a picture of the inside to show to you, but I have no cake left, so I do apologize about that! And of course, I did have a lot of fun making this party happen! 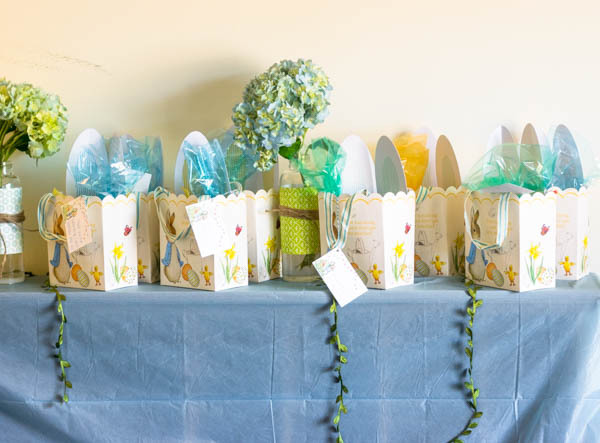 But to me, the most fun thing was to be able to give my son a beautiful birthday! I worked so hard, planning, organizing, cooking, decorating, in order to make this the perfect day! And this birthday boy deserves it! He had the most fun blowing the candles! I think that was his favorite part about the party. Oh, and eating the Panacottas, which were his favorite!! Loved everything about this Bday party!!! Stunning cake and food, fantastic theme! Decoration… Love then all. Wishing Luke a very happy and blessed Bday and many more to come! Estava tudo muito gostoso, festa muito bonita!!!! Thank you so much, Asia! Your pictures are amazing! I like all of Peter’s birthday goodies, but my favorite are those Lemon macaroons. Thanks for sharing! Camila! I love everything about this! You are so talented and creative, plus your food is so yummy sounding! I love that your dad makes amazing things too! What a wonderful family! 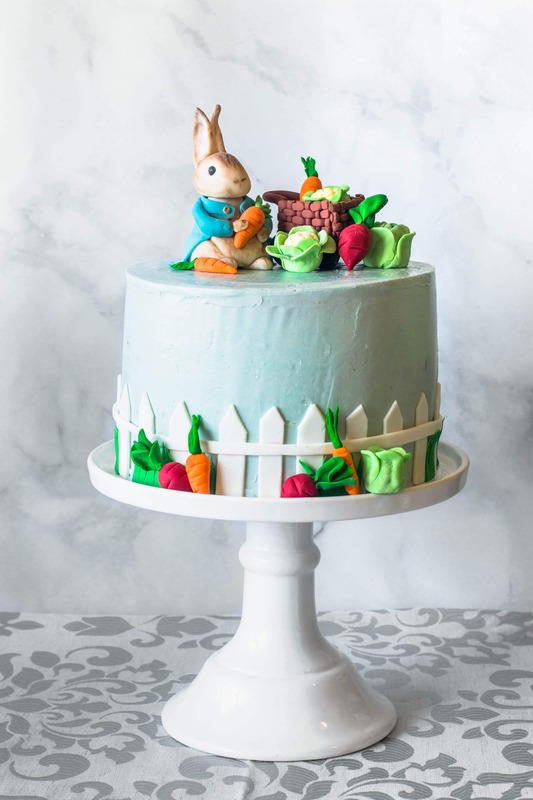 The charcuterie platter looks amazing and the pickled egg celery salad sounds divine, but the Peter Rabbit cake has to be the real showstopper here! So darn cute and fun! I love the theme, the cake. I love everything! I need you to make my sons cake for his next bday party haha! This is absolutely amazing! Beautiful pictures and idea for a theme. Elegant, fun, classic. oh my GOODNESS i’m dying over the cuteness of this party!!! and the cake is perfect! You nailed it! 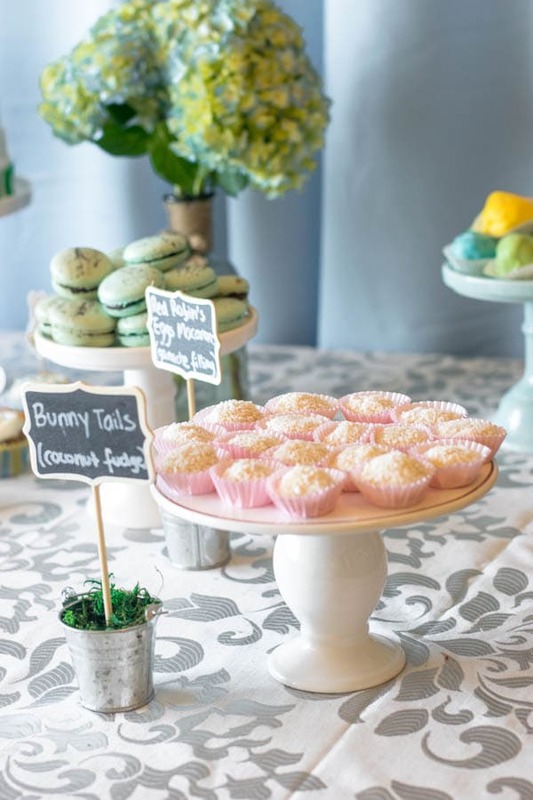 Such a cute party theme and WOW! That food spread looks incredible! I wish parties I went to had spreads like that. Haha! Awe thank you so much, Stephanie!! This means a lot to me! Wow, that was great. 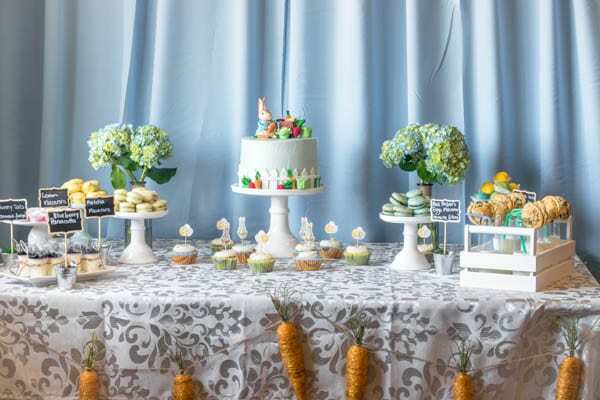 Looks so delicious and I am sure kids loved it and the food presentation, the decoration, and the theme were so perfect. 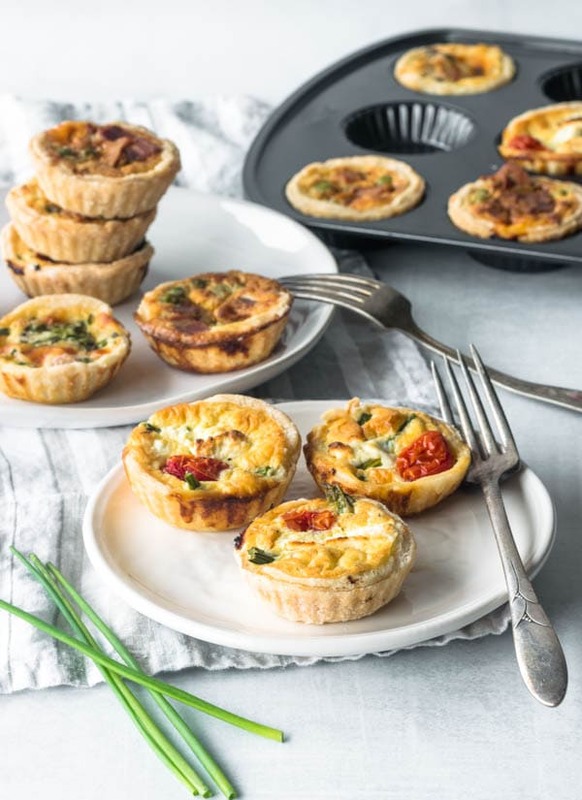 Thanks for sharing your idea with us. Thank you so much!! 🙂 I’m glad you liked it!